there was a contemporary breakfast at tiffany’s vibe at the kate spade show this spring. there was a mod feeling to the show, a nod to mod, let’s say, but there was an audrey hepburn-esque refinement to the collection with pretty, tailored trench coats in neutral color-blocking and dainty, feminine cocktail dresses. like last season, deborah lippmann did the nails for the show. 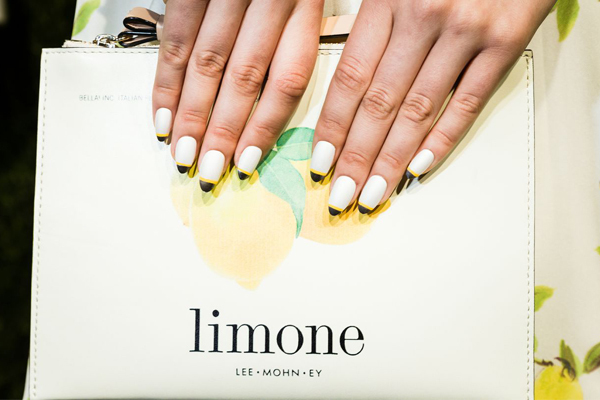 the nails were meant to resemble kate spade’s cap toe ballet flats — a classical piece with a playful twist. ms. lippmann used a new shade called pseudo silk kimono as the base color. it’s a new texture, dubbed ‘mateen’ as it leans toward being a shimmery, satiny matte. she also used a soon-to-be-released pewter shade called bad moon rising for the tips, and then one of three shades for the accent stripe: it’s raining men, walking on sunshine, or groove is in the heart. to recreate the look, start with a velvety white (pseudo silk kimono is lovely), and then paint a shimmering, gunmetal french tip. 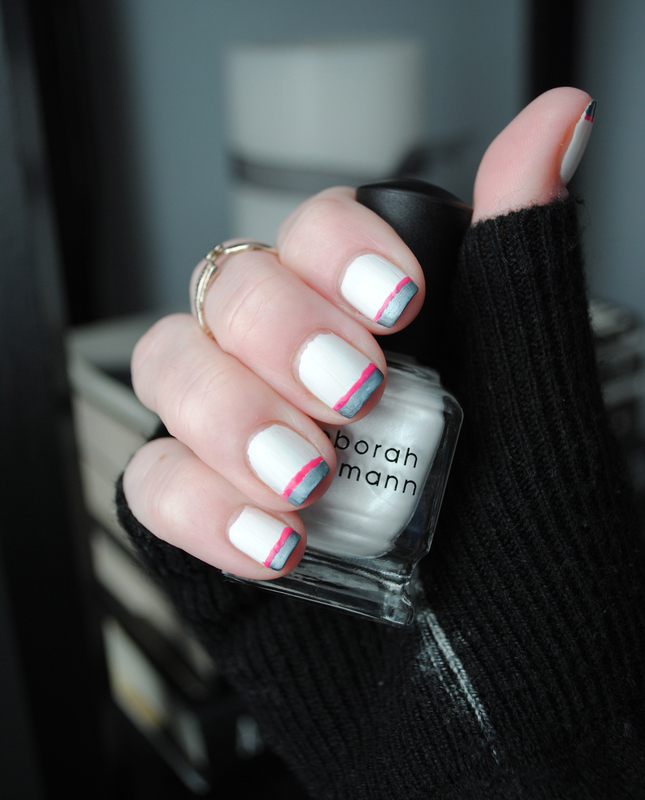 using a thin nail art brush, paint a stripe in red, pink, or yellow just below the pewter tip. if you are using pseudo silk kimono, i would not recommend adding a topcoat because you lose the natural mateen finish. for my manicure, i added a topcoat just over the pink stripe and gunmetal tip to seal in those colors. pseudo silk kimono is available now, for a limited time only, at refinery 29. bad moon rising will be released in october, and walking on sunshine will be available in the spring.